Laser Scanners used in production and in vehicle classifications. Safety laser scanners have a high resolution of 5-10 mm that allows individual body parts to be protected. Due to a low reflection, highly-sensitive avalanche photodiodes are required. 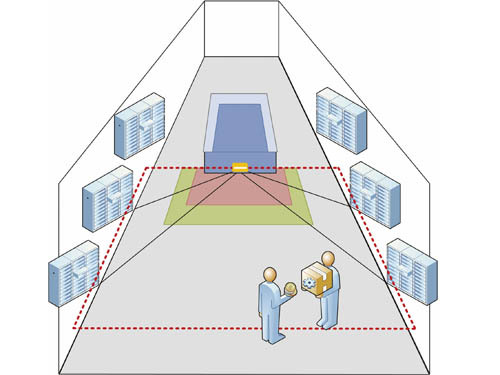 If the scanner is expanded to include the third dimension, it is then referred to as a laser tracker. Depending on the range (up to 40 m) and the resolution (up to 25 µm at 40 m), the laser tracker is equipped with different laser diodes and position-sensitive detectors. These laser trackers are used in basic quality control in customized part assembly or in fully-automated inspection operations in the automobile industry and aeronautics. The object specifications can also be precisely recorded, quickly modeled, easily analyzed, and displayed in 3D with the help of suitable software. Another field of application of pulsed laser diodes and photodiodes is in laser scanners used in vehicle classification. These scanners are installed above the road. The laser beams produce a "curtain” of infrared light. With the help of photodiode arrays, a three-dimensional profile of vehicles passing by can be recorded. The calculated height profile of the vehicle can be compared to predefined vehicle classes. Typical applications for these scanners include vehicle classification along toll roads, height measurement, vehicle recognition, trailer recognition, recognition of the direction in which a vehicle is traveling, recognition of vehicles traveling in the wrong direction, and data analysis for traffic statistics. In automated production and logistical processes, priority number one is effective accident prevention and personal safety. For this reason, safety laser scanners are used to safeguard the danger zones of stationary and mobile facilities or in unmanned vehicles. With the help of pulsed laser diodes and a rotating polygon mirror, a surface scanner is produced that permanently – similar to a radar – and two-dimensionally scans the entire danger zone at an angle range of 190° and a radius of several meters. Using PC software, the operating area can be programmed with independent protection and warning fields that can be switched at any time during operation using control signals. If a person enters the protection field, the person is recognized and the machine immediately deactivates.